It’s been 14 years since Enrique Norten‘s ship-like design was chosen to sail upon a triangular site in an ambitious arts district planned for the area around the Brooklyn Academy of Music. 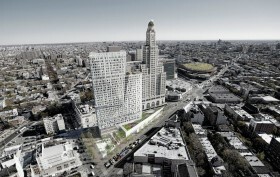 Initially proposed as an eight-story glass building to house the Brooklyn Library for the Visual and Performing Arts, the project was altered to a mixed-use high-rise when Two Trees Management was brought onboard during the economic downturn in 2008. 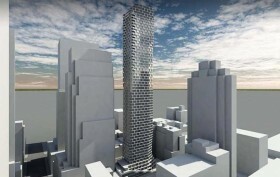 Now officially known as 300 Ashland Place, the slab-shaped tower is a silvery 32-story icon that architecture critic Carter Horsley praises as a “gleaming, but mysterious steed” in the emerging Downtown Brooklyn skyline. 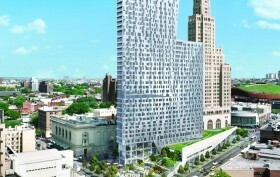 It will house a smattering of public uses in addition to 379 apartments above. Earlier this July, leasing began on the 300 market-rate apartments that go for roughly $2,850/month for studios, $3,600/month for one-bedrooms and $5,750/month for two-bedrooms. And now, a housing lottery has launched for the 76 affordable units that include $889/month studios, $949/month one-bedrooms, and $1,087/month two-bedrooms. 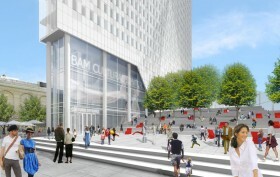 The latest tower to open its doors in Downtown Brooklyn‘s BAM Cultural District is 300 Ashland, a 35-story, mixed-use tower from Two Trees Management that is offering 300 no-fee rentals. There are currently nine units available with studios starting at $2,850/month, one-bedrooms at $3,300/month and a single three-bedrooms from $5,750/month. 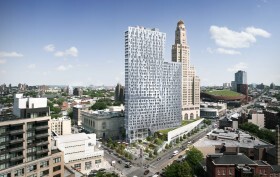 To coincide with the launch, the developer has published an official building website that brings a slew of new renderings, showing off TEN Arquitectos‘ perforated skin and the landscaped public plaza, as well as providing a first look inside the apartments. Here’s a first look at the mysterious home being built at 217 West 20th Street between Seventh and Eighth Avenues in Chelsea. 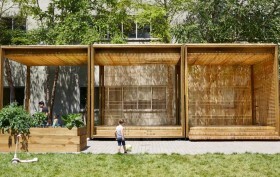 Plans filed with the Department of Buildings in 2014 detail the construction of a six-story, 10,000-square-foot, single-family residence designed by Enrique Norten’s TEN Arquitectos. The occupancy schedule indicates that the first level will contain a garage, and a single dwelling unit will encompass all floors above. The exterior rendering posted on the project’s construction fence depicts an impervious-looking first floor clad in a bronze-colored material. The next five levels are enclosed in a transparent glass curtain wall with brise-soleil screens floating beyond the building face. 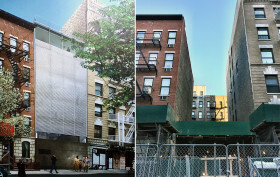 TEN has used this sun-shading and privacy tactic for many of their Latin American projects and the nearby Americano Hotel in West Chelsea.